Inspire’s Heritage and Music Services put on a unique collaborative showing of the iconic 1916 film The Battle of the Somme. Inspire is a Community Benefit Society that delivers a range of cultural, art, library and learning services on behalf of Nottinghamshire County Council. 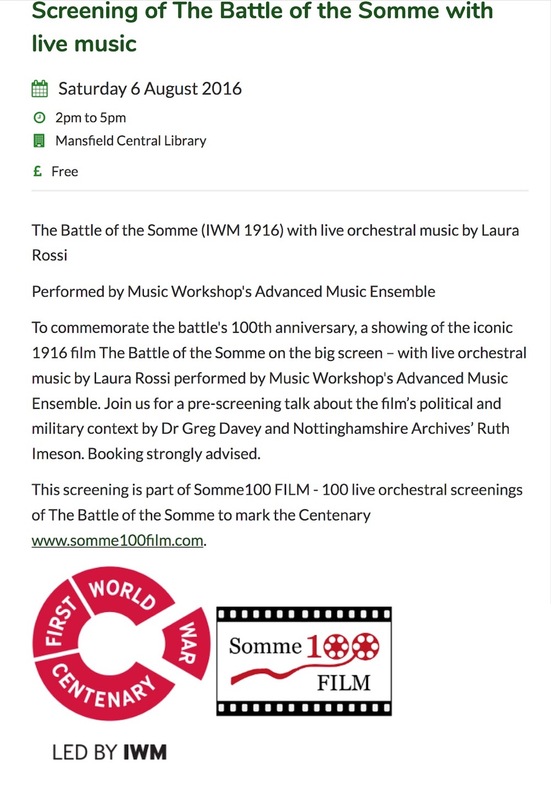 To commemorate the battle’s 100th anniversary, they screened the iconic 1916 film The Battle of the Somme with live orchestral music by Laura Rossi performed by Music Workshop’s Advanced Music Ensemble. There was a pre-screening talk about the film’s political and military context by Dr Greg Davey (a highly experienced battlefield guide and teacher) and Nottinghamshire Archives’ Ruth Imeson and through original archives told the stories of some of the local men who fell during the campaign.